I don’t normally care for cheese with “stuff” in it. You know, cumin or little dried fruits people like to stick in a perfectly good wheel of cheese. It just gets in the way, kind of like when you put nuts in chocolate chip cookies and brownies; so when Beta Wife brought my attention to a cheese with pumpkin seeds, I had my doubts. But in the spirit of the season we decided to give it a try, and I’m glad we did because it’s my new favorite cheese. 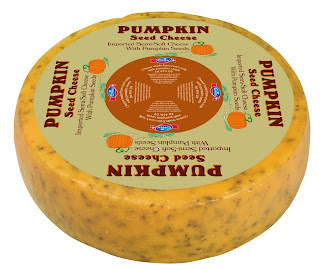 The pumpkin seed cheese from Emmi is a cow’s milk cheese made in Austria, so right away you get some points for Fall festivity and Oktoberfest. It’s a creamy, semi-soft cheese that’s mild and yet complex. Nutty and tangy, it matures about six weeks. It’s only available seasonally so you have a limited time to try it and it may prove hard to find, but I strongly recommend you go looking for it. I’ve been buying Emmi at Whole Foods, and although they don’t carry it at all of their stores, it's a good place to start. Thanks to the nice folks at Whole Foods for helping me get info. on this mysterious cheese. Stock photo (first displayed) provided by Whole Foods. might i suggest Red Dragon Cheese if you have never had it. 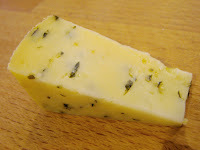 its a delightful cheddar with brown ale and mustard seeds. I could eat an entire wheel in one sitting. Then curse myself for it for three days. sigh.